In Aperture, projects are ‘exclusive’, like folders. A photo can only be in one project or another – it can’t be in two places at once. That’s why you you need albums, which I’ll call ‘inclusive’. You can add the same picture to as many different albums as you like. Now here’s the key thing about Aperture – you can create albums within projects. Let’s say you come back from a full-day’s shooting or a vacation with hundreds of images of different subjects. What could be more natural than creating an album within the project for each subject? Or maybe you decide some would look good in black and white, or some need a ‘toy camera’ effect? You might want to split those off into separate albums too. Aperture can create albums within projects, but Lightroom insists on separating folders and collections completely. Lightroom can’t do this. 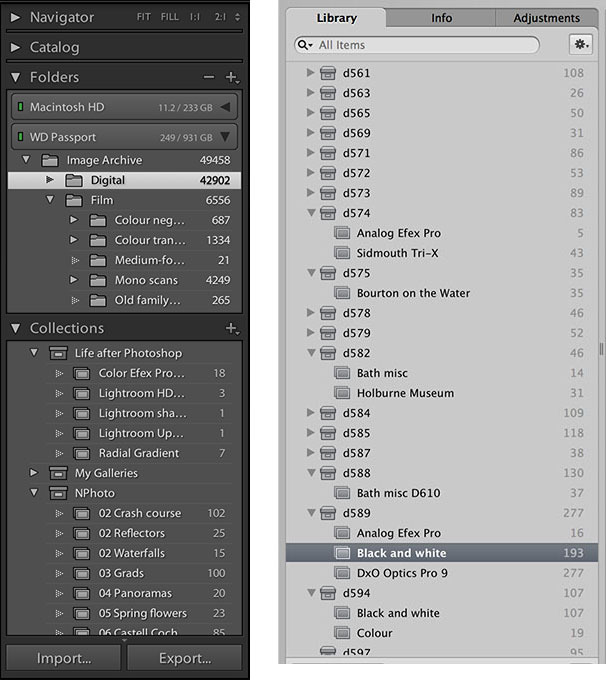 It can create albums (called ‘collections’ in Lightroom), but they’re managed in a completely separate way to folders, in a completely separate panel. You can’t add an album to a folder. I’d like to know how Lightroom users cope with this. I’ve been using Lightroom ever since it was launched, so I’m no novice – and yet I’ve never been satisfied with this separation between folders and collections. I can’t find a way to organise my images that doesn’t mean working with two separate but parallel filing systems. My instinct is to work with folders, but I’m more or less forced into using collections because the Folders panel is visible only within the Library module – everywhere else, only the Collections panel is visible.